During a period spanning just over two weeks in early to mid-August of 2014, three UFO sightings were reported from Jasper County and adjoining areas of its neighbor to the south, Newton County. In this column and in the near future, my intention is to inform my readers on all three of them. (My personal investigation into one incident of the trio is still in progress, and additional information on the other two may also be obtained.) The first occurred at 5:12 a.m. on the morning of Aug. 2, and the lone witness was a Missouri State Trooper driving north on Rangeline Road in the course of routine patrol. (Margie Kay, the Mutual UFO Network assistant state director, who had interviewed him, provided a transcript which was then posted on the UFO Casebook website, one of the best.) The officer first observed an unusual light in the northeastern sky, not far above the horizon. His first thought was that he was seeing a helicopter, since it was obviously too low to be a fixed wing aircraft. Then as it got closer, he was able to make out a triangular or teardrop-shaped craft with illuminated windows in the upper portion, through which he could see indistinct movement that he assumed to be passengers or crew members. The craft was estimated to be in excess of 100-feet in width and perhaps a fourth of that in height. At its nearest point to the witness, a distance of approximately 50 feet, red and yellow lights of various sizes were noted on the underside and a low hum could be heard emanating from the UFO. There was also evidence of a minor electromagnetic effect occurring at the moment the odd craft abruptly pivoted to fly off back to the east (at an undescribed speed) until it was no longer visible. At the moment the UFO performed its 180-degree rotation there was an approximate 15 second burst of static from the car’s radio. Adding to the mystery was the fact that the patrol car was stationary in the roadway after the object departed, although he did not remember stopping or even intending to do so, and the encounter had not seemed to last for 15 minutes as the vehicle’s clock indicated. (Before we take off into any wild speculation based on these seeming discrepancies, it should be noted that the excitement of the encounter at such close range could have easily been the culprit.) Finally, in an element that is often reported in such cases, the trooper watched a jet come from the east, making a wide looping curve to the north before returning to the east. If it was not searching for the unknown craft, its presence and maneuvers were quite a coincidence. The investigation into this potentially important encounter is ongoing. MUFON is still delving into it, and I have put out “feelers” to some of my own reliable sources in the area in an effort to not only learn more about the trooper’s experience but to possibly locate other possible corroborating witnesses. This entry was posted in ABDUCTION, MISSING TIME, UFO, UFO ARTICLES and tagged ABDUCTION, ALIEN CRAFT, boomerang, chris holly, close encounter, comets, debunkers, DISC, discoveries, erratic movements, FLYING SAUCER, ifo, jasper county, KEN PFEIFER, LIGHTS, meteors, military, MISSING TIME, missouri, MOON, MUFON, newton county, nufors.com, ORBS, pfeifer, state trooper, TRIANGLE, ufo, uso, v-shape, worldufophotos, worldufophotosandnews by KEN PFEIFER. Bookmark the permalink. I just want to tell you that I’m newbie to blogging and definitely enjoyed this website. Almost certainly I’m planning to bookmark your blog post . You surely come with very good posts. Cheers for sharing with us your blog. I’m still learning from you, but I’m making my way to the top as well. I absolutely liked reading all that is posted on your website.Keep the information coming. I loved it! Hi there, what do you think on the subject of aptoide? Very neat subject, isn’t it? Hi my friend! I wish to say that this article is awesome, nice written and come with almost all significant infos. I would like to see extra posts like this . I was speaking with a buddy of my own about this info and even about omega xl review as well. I do think you made a number of very good points on this page, we’re looking forward to find out more information from you. The aircraft described sounds a lot like a B2 stealth bomber. The B2 has a wingspan of 172ft. and a height of 17ft. 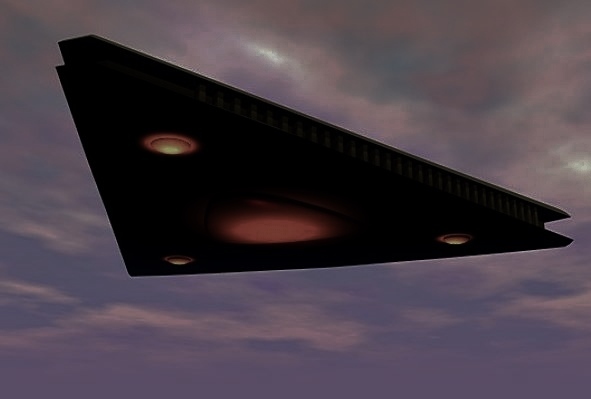 The overall shape of the B2 roughly resembles a triangle and there is an air force base not far from the sightings that houses some B2’s as well as F117’s, which are similar. For a quick look, go on to maps.google.com or google earth and search for ‘Whiteman Air Force Base’ and you will see a B2 right on the tarmac.